A Groomswear Guide: All You Need To Know About Key Accessories For The Fashion-Forward Man. We noticed that while the female population has thousands of beauty and fashion blogs to help them out when they’re in need of some fashion advice, the count is considerably low for our boys. And that just doesn’t seem fair. Everyone wants to look pretty, right! So being a strong believer in equality and hating on all kinds of gender discrimination, it only makes sense to help alleviate that problem. What we’ve put together for all you handsome grooms-to-be is an essential, all-informative guide to types of footwear, ties and a lot more accessories to have you looking every bit of the dashing young man that you are. 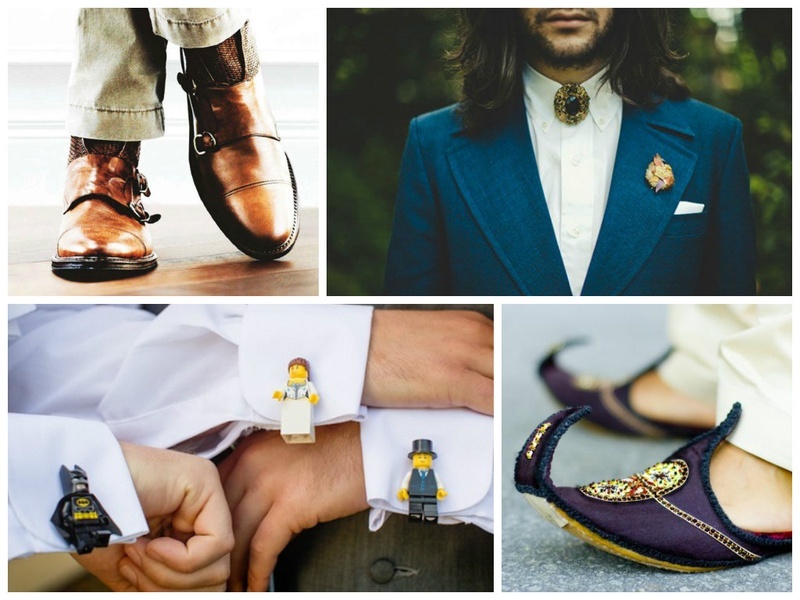 Keep scrolling for some great visual inspo and know-how on all you need to learn about groomswear accessories for the fashion savvy Indian man. A pair of these speaks volumes in sophistication. It is minimal, subtle and ideal for men with a refined taste. If you’re the kinda guy who wants to avoid laces at all costs, this one’s just the one for you. Not to mention, the unique style of straps certainly grab attention. A classic and versatile style, they can be suited to fit a formal attire or a casual one. If you’re looking for a good, formal pair to fit an Indian wedding, try out velvet or leather loafers. Ideally fits the term ‘suited-and-booted’. It not only exudes personality but will have you looking quite sharp. However, you need to find the right silhouette and height to match your attire. What we love about this shoe style is the trademark punch-hole designs on its surface. They certainly stand apart from usual and plain styles, with their trendy, decorative aesthetic. We suggest you go for a pair of browns that can worn multiple times even after the occasion you purchase them for. For all the grooms who love a variety of tones, you have found the perfect pair to don. When selecting the shades that you would like to sport, we suggest that you pick two of the same family. But if you prefer a little contrast, ensure that the colours match your attire. These Maharashtrian sandals are not only trending but also comfy. Using original brown shaded leather and some intricate work with sometimes, hints of colour, it’s perfect for an ethnic occasion. Juttis and Mojaris look similar and people often confuse the two. The basic difference is that Juttis have a flat front and a closed back while Mojaris have a pointed front and an open back. They are available in decorative designs with vibrant embroidery or mirror-work, making them blend impeccably with your Indian wedding attire. Originally made of wood, these go way back in Indian history. But as fashion tends to be a cycle, modern designers style them in colourful, user-friendly materials that would go brilliantly over any outfit. This commonly used style has a variety of options when it comes to prints, colours, fabric and widths. You can experiment with various knots for an elegant or edgier look. The bow-tie, as we know, originated in the west of course and was mostly used for formal events like balls and weddings. These classically quaint styles are worn with an open collar shirt with the fabric tucked in to cover the neck and chest. They look a lot more decorative than your standard neck-tie and would make a great statement at a wedding. Basically, the cravat’s dressier friend. Bolo-ties have a piece of jewellery or embellishment that sits at the centre of the neck. They may not be used as much but personally, I think it would quite good at any dressy occasion. These are fairly simple to tie and may be a little too casual for a wedding, but is still an option for groomsmen or even anyone who prefers a relaxed, casual look. Fairly easy to use and most-commonly found, this style incorporates a cylindrical piece set between two bars, that is required to be turned 90 degrees to lock. These are identified by the flat head with a whale-like closure that fits against the back of the head once it’s locked. This type of cufflink has two identical heads connected by a chain. It allows for a looser fastening with decoration visible on both sides of the buttonholes. Stud or button cufflinks are essentially a lot more secure and durable as they have no moving parts or hinge mechanism. One head is fitted through the button hole and then straightened out to lock it in place. Similar to the fastening of a metal wristwatch, this locking mechanism is rather contemporary and stays secure and is easily handled. The heads consist of two decorative knots and are connected by a flexible cord. They allow for a semi-formal or casual hint to your attire. Though, they are less durable and also less expensive. Though the shape of the head may vary, the back end is always in a ball shape and usually comes in fixed closure forms. When made in precious metals, the rate invariably goes up as the amount of metal used for an entire ball tends to be larger. Also, check out some of these interesting wedding cufflink designs for grooms, groomsmen and fathers of the bride!